This very fine 1960s diamond ring has been crafted in platinum. The impressive convex pierced decorated mount displays a feature modern brilliant round cut diamond held in relief in a six claw, fluted decorated setting to the centre. This diamond is encircled by eight individually four claw set modern brilliant round cut diamonds, bordered by a pavé set halo, ornamented with sixteen modern brilliant round cut diamonds. The plain platinum ring shank is subtly embellished with a simple ribbed design, at the junction with the pierced decorated, elevated subtly flared shoulders. 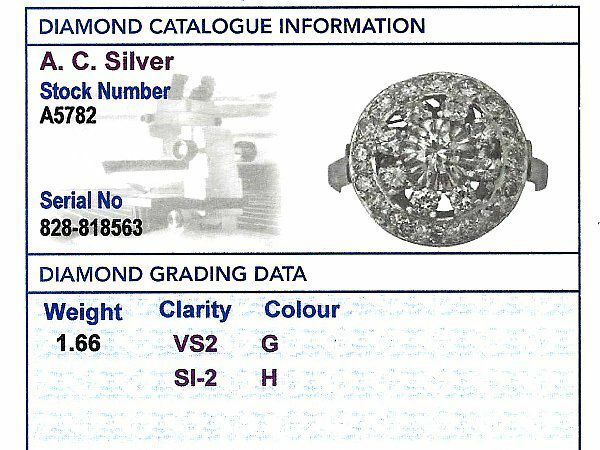 This vintage ring is supplied with an independent diamond grading report card. This impressive 1960s ring has been independently tested using state of the art technology (Niton XL2 Analyzer) and verified as platinum. 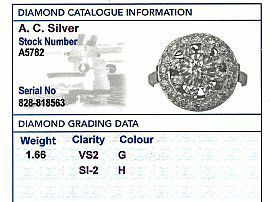 This large cocktail ring is fine quality, set with very high colour graded and high clarity graded diamonds. The ring is a very good gauge of platinum and in excellent condition. Length of setting 1.63cm / 0.64"
Width across setting 1.69cm / 0.66"
Height of setting 1.05cm / 0.14"